Like most beauty junkies I have an entire basket full of beauty products that I don't love yet don't loathe enough to throw out or pass on to someone else to enjoy. Fickle, I believe is the term. 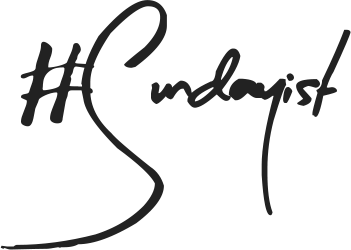 I make it my personal mission to keep re-trying each product and if after three re-discoveries shall we call them my mind is not made up I let the products go. Waste not, want not. Normally changing how I apply products is what makes them a make or break deal which leads me on to what I have made work for me in the past few weeks. 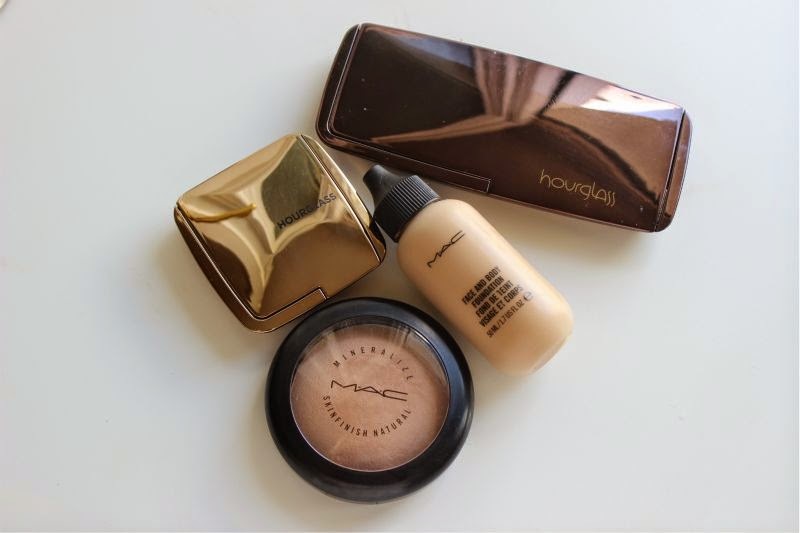 MAC Face and Body Foundation, basically you either love it or hate it. The Marmite of the foundation world. I admit that for the longest time I gave up on MAC Face and Body Foundation despite purchasing three bottles in as many years determined that I would unveil its magic somehow. Typically this foundation separates on my face, oxidises and clings to dry skin areas that I didn't know existed. A winning combination if ever there was one - not! My problem was that I expected too much from this foundation, I would slick this on without primer and simply expect it to do marvellous things. Teamed with Max Factor Facefinity Primer I finally see what the fuss is all about, a big dense foundation brush also helps immensely. Don't get me wrong MAC Face and Body Foundation is still a foundation I keep for "really good skin days" as it offers no more coverage than a tinted moisturiser. That being said I am glad that I have finally got it to work for me. 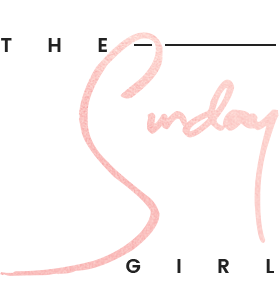 The Hourglass Ambient Powder range is one I never fully got - I lusted after each and every product launch and always felt slightly let down. My main problem was getting to grips with the fact that unlike the likes of The Balm this range has been created to look muted not obvious. More often than not I have been sporting Hourglass Ambient Lighting Blush in Dim Infusion - a weakly pigmented blush unless you have the right tool. You need a blush brush that has a slightly drier texture so it picks up more product than you would usually use and bob is you uncle. Oddly despite applying more blush than normal the end result is still light and glowy, only with more pigment. I know it seems obvious but it really is funny how one tool can change how you feel about a product. The blush brush in question for me ended up being Chanel Pinceau Blush No4 Blush Brush which at £33 was not cheap and a complete impulse buy but hey at least it has ended well. 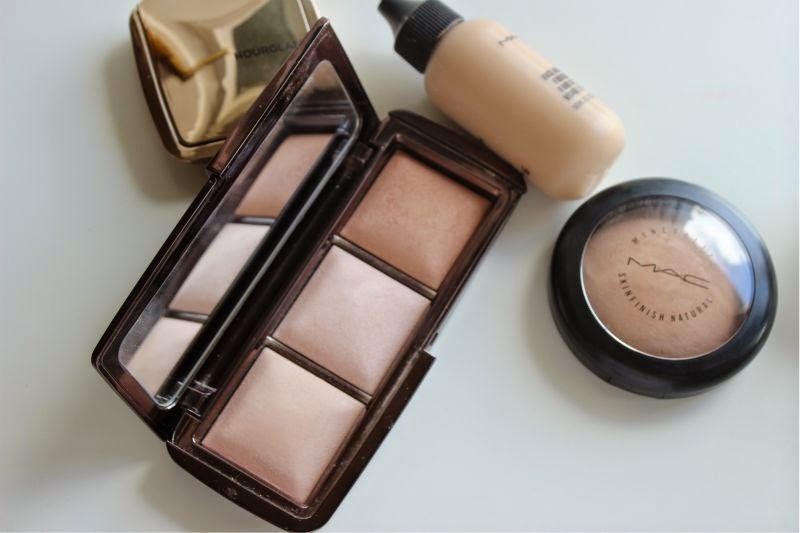 Now for the Hourglass Ambient Lighting Palette, three shades - all beautiful yet seldom used. Why? I have no real idea other than the fact I don't really do subtle highlighters but I have slowly warmed to this palette, without the need for several brushes to do so. After setting my make-up with a loose, HD Powder (normally MAC) I have taken to brushing a light dusting of Hourglass Dim Infusion all over my face. It doesn't cake with the other powder but rather adds a luminosity to my skin, one that foundation doesn't always achieve. It perks up my dull skin and just makes me glow without the need of extra highlighter. The other two shades I am working on but progress is progress...at least that is what I tell myself. Come the summer months I become super oily, so much so that I pretty much throw in the towel and accept my fate. I bought MAC Mineralize Skin Finish in Medium Plus quite some while ago and never got to grips with it. It doesn't do a stellar enough job on my oily skin to be used as a setting powder, it isn't deep or light enough for me to highlight or contour and oddly when used alone as a powder foundation it turns bright orange on my skin. By accident I popped this into my daily make-up bag (I initially wanted to pack MAC Stereo Rose) and through necessity I dabbed this over my already set make-up to remove excess shine. It worked a treat, like a blotting powder it left my skin matte, didn't deposit any real traces of colour and most importantly didn't feel heavy or look cakey. I don't typically recommend using two setting powders as it is expensive and for 99.9% of people unnecessary but this method really works for my super, super oily skin. Four products back in rotation isn't too shabby is it? I really like the Hourglass Ambient Lighting Blushes because they're subtle but still give a bit of glow... if you thought Dim Infusion was too light check out Mood Exposure! I have the exact same problem with my Hourglass blush but will definitely try using a different brush, hopefully this will bring it to life! I definitely had the MAC face and body all wrong - I thought it would be much higher coverage (I don't know why!) - glad you've learned to love these products though, nothing worse than wasting money on unused products! I really want to desperatley try the Hourglass ambient lighting powder! It seems to be really amazing and gives a nice finish to the skin which I am intrigued about. 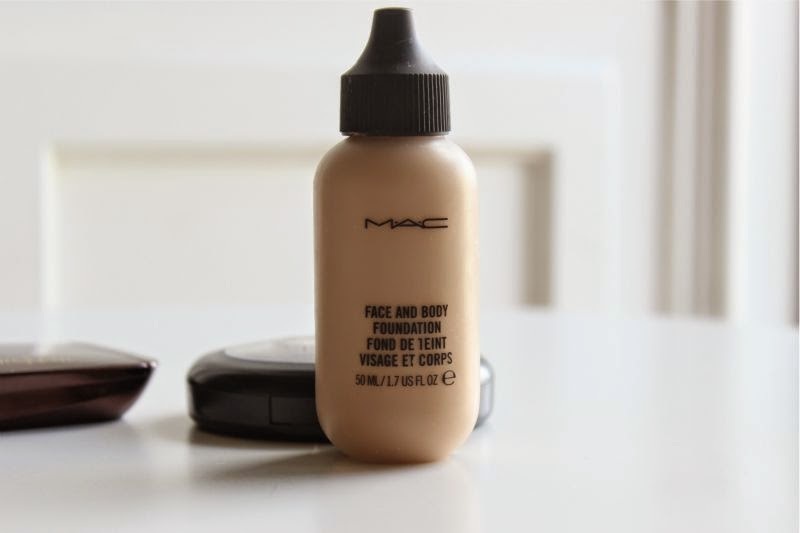 The MAC face and body foundation i am staying clear of because I tried it on my face once and it just emphasised my pores and made me extra greasy looking after a while. I'm glad that you have found a way to work with it. Thank you for posting, it was very enjoyable to read. I really need to rotate my stash better. I completely agree with you having the Blush and Setting Powders from Hourglass here... I regret buying mine too! Hopefully like you I just need to try out different methods of application. These look like great products! 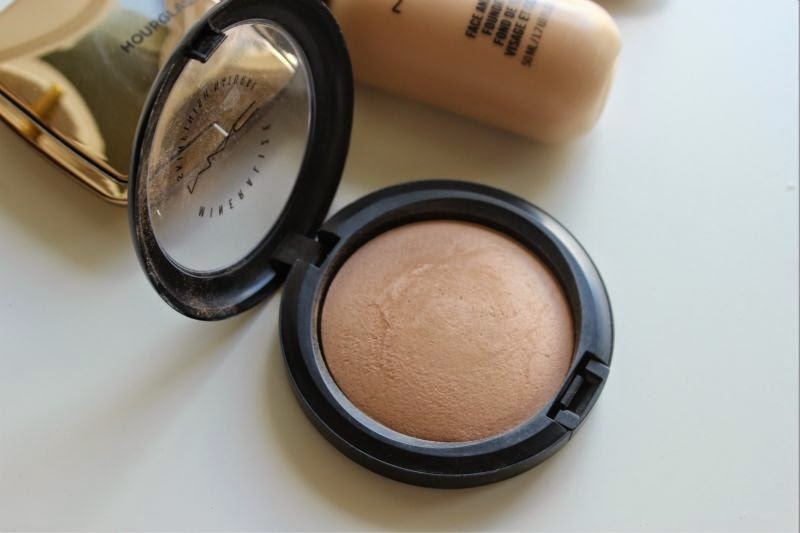 But the Mac Foundation just doesn't look like something that would work for me..
Hahah I love that you called Face & Body the marmite of the foundation world, so true! I do like the mac face and body foundation, but i find i need to apply a few layers before i even look human-like! I have the Ambient Lighting Blushes in Mood Exposure, Luminous Flush and Radiant Magenta. No pigmentation problems there!!! I have similar problems to you with the Ambient Lighting Palette and Mac Mineralize skinfinish though. I think I just don't like powder. The reason I haven't bought any hourglass ambient lighting powders is for the same reason - I don't really think I would get much use out of them! But hearing the way you use them has made me reconsider. I should give Mac Face & Body a try then, anything that offers light coverage is right up my alley! I have the MAC Mineralize Skinfinish Natural in Medium, it's too dark for my skin to use as an all over foundation. But like you i've discovered it's great for lightly dabbing over my nose and other areas that get oily. Sometimes I do use it to do a bit of contouring. I've been wanting to try out that Hourglass palette! I have been having a huge problem with my skin looking like total crap lately and texture issues, so crazy highlighters look very bad on me. Sounds like muted highlighters would be the best course of action for me! I have always lusted after the Hourglass Ambient Lighting Powders, but I was never sure if they were worth it. I much prefer an obvious highlight, and I can't imagine spending £40 odd for a powder! Glad you kind of agree. 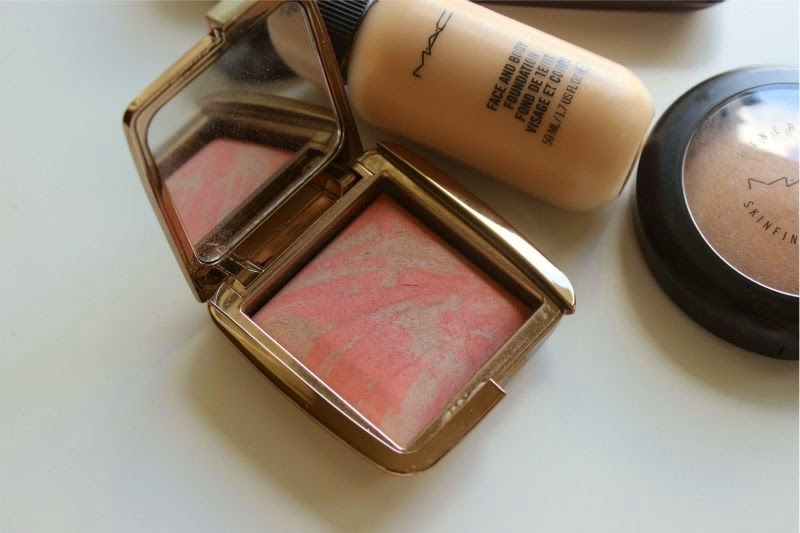 I've had my eyes set on the ambient lighting blushes and trio for a while! All I've heard is good reviews, sometime it is actually nice to hear someone not getting on with it straight away! Otherwise the reviews can feel a bit false if its positive all the time! I've heard so many good things about the MAC Face and Body, I've heard that it's perfect for dry skin but after reading this I'm slightly unsure whether I should purchase it or not. I've heard good reviews about the RMK Creamy Foundation! It is expensive but I know alot of people with dry skin who love this. I wanted MAC F&B to work for me because I love light foundations and wanted something for everyday looks. It also oxidized like crazy on me. I bought C2 for my NC25ish skin and while it looked yellow enough on, it soon turned orange. It was a long process, but I managed to return it to the MAC website. I still look longingly at it though... Mary Greenwell spoke so highly of it.